The innovative formula contains Echinacea and now includes Glucafeed®, a B-glucan produced via a specific and unique fermentation and extraction process. This unique production method is what makes this ingredient so beneficial in nutritional supplementation for horses during high-risk seasons. The new Immuno RS formula is enhanced by the antioxidant properties of vitamins A, C and E, and zinc and selenium chelates. Enriched with plants (e.g. Echinacea) Immuno RS is particularly recommended ahead of high-risk periods (winter, intensive training, relocation, etc). Plan ahead for high-risk periods for young foals, overtrained horses, and in the event of changes to a horse’s environment. 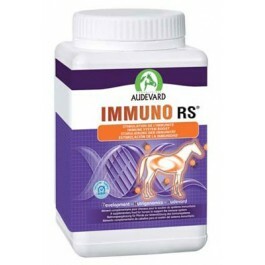 Give horses being introduced to a new environment a 10-day to three-month course of Immuno RS. Raw material:Calcium carbonate, mineral dicalcium phosphate, whey, echinacea (Echinacea purpura), sugar beet molasses, Glucafeed® (yeast wall extract). Analytical constituents :humidity < 8 %, crude proteins 6.7 %, crude fats 3.7 %, crude ash 47 %, crude cellulose 1.5 %, calcium 16 %, phosphorous 4 %, sodium 1 %, magnesium 0.5%. One 50g measure morning and evening for 10 days to three months, as required. If necessary, Immuno RS can also be used continuously.